In other words, these stories are the result of a direct payment for a specific story to be written. The payment came from a group that’s bankrolling the entire #ExxonKnew campaign, which needs these news stories to support its talking points. And what’s even more stunning is that this funding information originally wasn’t disclosed. In fact, the Rockefellers and Columbia School of Journalism were previously so invested in hiding their affiliation that when the stories appeared in the Los Angeles Times there was no mention that the Columbia School of Journalism is funded by Rockefellers. Only after Energy In Depth and other news outlets called them out did the outlet quietly add a correction noting the funding source, but that happened several months after the stories were published. That’s not all: even the website of the Columbia Energy and Environment Reporting Fellowship did not originally disclose its Rockefeller funding according to an archived copy of the page. But once again, after the funding was revealed, the fellowship’s website was quietly updated to include its financial connections to the RFF and other organizations. But now – after denying that they targeted a particular company – the funders are admitting they had Exxon in mind when they paid for the Columbia reporting project. 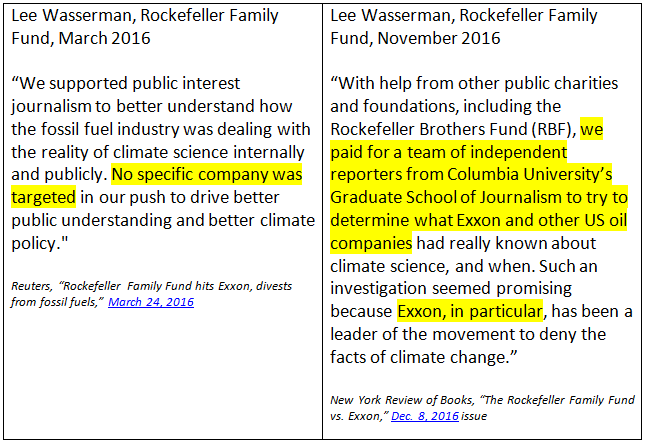 And wouldn’t you know, Columbia’s team of reporters went after Exxon in just the way their donors wanted. Are we supposed to believe this is a mere coincidence? That’s just one of the questions Steve Coll can expect to be asked over the coming days and weeks from the press, from media watchdogs and from people who respect the Columbia Journalism School and wonder what’s happened to it.